It appears that medicine is facing a huge challenge. Neurosurgeons all over the globe have to deal with the aging spine and all of the many repercussions that it entails. The numbers are astounding. In four short years we'll start to see why the presence of bone health was talked about so ceaselessly. Seventy-five million Americans will be over the age of 65 in the year of 2020; 14 million will have osteoporosis. More than double that number will have some type of issue with their bone mass. The costs of osteoporosis are astronomical, with it coming in at $20 billion annually. Just in the decade span of 1998 to 2008, the age that spinal surgery is performed went from 54 to 49. This influx rises all the time. While life expectancy makes it seem that living a vibrant and active life into your older age is likely, the state of the spine may compromise that ability. Spines are incredibly vulnerable. Some age badly while things like injury impede others. Spines serve one of the most integral aspects of our mobility. It serves as how our nerves interact and relate to the rest of our body, and how we experience things like pain and overall function. Flexibility is also intrinsically required for even the simple day-to-day tasks we often take for granted. This isn't referring to the type of flexibility that is needed to do the splits. Things like getting dressed, showering and going to the bathroom require a specific amount of flexibility that can be compromised by an aging spine. A bone density test should be routinely completed to rule out any presence of the condition. Just as other screenings are recommended annually for specific health issues, this one is for the health of your bones and should not be brushed aside. There are ways that the condition can be preventable. While it isn't entirely in the hands of preventative measures, they can help to thwart off the issue. 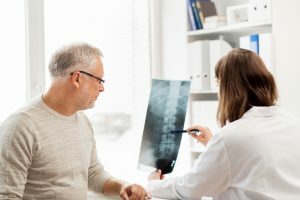 Osteoporosis and neurosurgery are connected in that the pain people can sometimes experience, even when they are relatively healthy, can be the result of osteoporosis. An elderly man with an immense quality of life, who walked daily and played tennis three times a week, started experiencing debilitating pain. His pain was to the point that he couldn't walk around the block or even play tennis for 10 minutes without having to stop. It was found that he was suffering from osteoporosis, a more specific type that causes a curvature of the spine called scoliosis and the narrowing of the spinal canal referred to as stenosis. The presence of calcium and magnesium will help in the strengthening of the bones. Getting adequate levels of vitamin D is also incredibly crucial to your overall bone health, which is coincidentally one of the most common vitamin deficiencies reported.